Robb Kendrick has two new books of tintypes appearing at virtually the same time. Still, published by the University of Texas Press, is a book of photographs of contemporary cowboys from all over the Western United States, Canada, and Mexico. Looking through its pages you could swear most of the images were straight out of the 19th century. Still is a counterpart to Robb’s earlier work of Texas tintypes, Revealing Character. Robb’s other new book, Changelings, is the subject of this interview. Changelings is being published in a limited edition of 113 copies by Cloverleaf Press of Austin, Texas. 100 of the books, each containing a signed and numbered platinum/palladium print, will sell for $700. The remaining 13 books, each containing a signed and numbered platinum/palladium print plus two original tintypes, will sell for $3500. E.B. 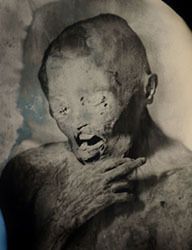 : How did you come to make these striking images of mummies? R.K.: We moved to Mexico about two years ago. I've been visiting off and on for 24 years and have always found the Mexicans accept death in a very different way than we do in the USA. Death, though sad, is an accepted part of the human journey and on "Day of the Dead" the dead are celebrated, remembered with parties on the graves of the deceased, meals shared on grave and stories about those no longer among us. This is only the beginning of a bigger project that explores "death in Mexico" and will probably conclude in the next 12-18 months. 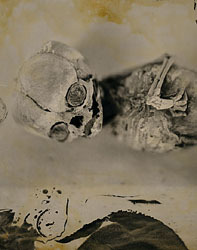 All the images were shot using the tintype process and some of the plates are distressed afterwards. Thomas Lynch, an acclaimed poet, essayist and third generation undertaker, provided the thoughtful text. E.B. : Why do you think the attitude toward the dead evolved as it did in Mexico? Is there influence from native religious traditions? I'm certain there is influence from Christianity, but I've travelled in Spain and never seen anything quite like the Mexican tradition of observances for the dead. R.K.: Mexican society has a humor and aesthetic value of death that is truly unique. The conquest of Mexico resulted in a veritable holocaust for the native population and at that point the state “nationalized” death and all matters concerning death, such as mortuary practices. The promotion of death-related imagery from the 16th century through the Mexican revolutionary period gave rise to the Mexican “cult of death.” Also, the elevation of All Saints and All Souls Days to a central part of the annual ceremonies gave it more significance. There is a familiarity with the proximity of Death itself in Mexico. It has almost been domesticated--it is part of popular art, fine art and ideology here. Elaborate domestic family rituals during Days of the Dead were at first a challenge to the authority of the Church, but ultimately developed to combine family devotion and communal devotion in a new way. Mexicans invented their own manner of celebrating this universal Catholic holiday. It is a time to remember the dead, spend time by their side at the cemetary, share their favorite food , tell stories of the deceased and play their favorite music. The dead are always alive in the minds of their families. Today there are 23 mummy museums in Mexico and there is a traveling exhibition currently touring the country. E.B. : So who made the mummies (or are they natural)? The Mummies of Guanajuato are a number of naturally mummified bodies interred during a cholera outbreak around Guanajuato, Mexico in 1833. The bodies were mummified due to the air and weather in the area. Due to the ferocity of the epidemic, more cemeteries had to be opened in San Cayetano as well as Cañada de Marfil. Many of the bodies were buried immediately to control the spread of the disease; in some cases, the dying were buried alive by accident. 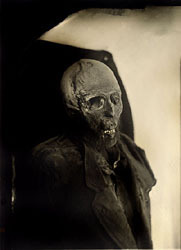 As a result, some of the mummies have horrific expressions attesting to their death in the tombs, though most expressions became fixed postmortem. The first mummy was put on display in 1965. It was the body of Dr. Remigio Leroy, currently on display at the Guanajuato Mummy Museum. This museum, containing at least 108 corpses, is located above the spot where the mummies were first discovered. Numerous mummies can be seen throughout the exhibition, of varying sizes. This museum is known to have the smallest mummy in the world, a fetus from a pregnant woman who fell victim to the disease, also mummified. Some of the mummies can be seen wearing parts of their clothing from when they were buried. The bodies were removed from the crypt when their family members stopped paying upkeep. However, the law was changed, and bodies are no longer removed from their resting-places for this reason. E.B. : Okay. I'm starting to get the picture. It's dry in the mountains of Western Mexico, so mummies form naturally because corpses don't decompose. I can see that tintype would be an ideal medium in which to photograph them. 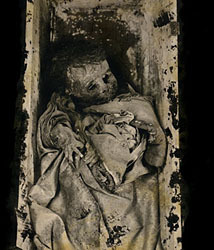 You mentioned that some of the tintypes are "distressed." Tell me how you do that. R.K.: To distress the plates I take what I would call the "seconds" or plates that I have a very good unaltered duplicate of. The "second" represents a plate that did not make the cut for some reason. I use a torch, lavender varnish, brushes, grain alcohol, my fingerprints--just about anything I can think of on the fly that will transform the plate. While the plate is warm and has the varnish on the surface it is possible to manipulate and change the plate. Most everything done is irreversible and not able to be duplicated, so like the tintype each distressed plate is a further one of a kind. I've taken plates that were distressed and two weeks later continued the distressing, as I think of new ways to change it. The torch is used to help make the emulsion open to distressing and for igniting the varnish and grain alcohol. As you can imagine this may not be the safest combination, so please be cautious when attempting anything described. I've also had a plate that was fantastic looking and I continued to push it and it was totally ruined. It was lost forever. E.B. : You also mentioned that each book would contain a platinum/palladium print. Tell me how you go about making these. R.K.: I scan the image at very high resolution and do any spotting and basic adjustments to try and make the file look as close to the tintype as possible. Chris McCaw in San Francisco, CA, who is well known for this kind of printing, takes it from there. I am assuming, but you would have to talk to him, that the file is adjusted in such a way that the digital negative he produces will yield a platinum/palladium print that closely matches the EPSON proof print that I provide. Chris then sends a proof to me for approval and to sign off on. This becomes his working proof to match all other prints to. He nailed it the first go around and had my blessing to produce the whole set of 113 final prints.